Blizzard has benched the best assassin in its up-and-coming MOBA Heroes of the Storm, banning StarCraft star Zeratul from use in the game’s first real round of professional tournaments for the indefinite future. 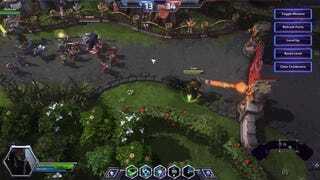 While Blizzard hasn’t exactly confirmed this, the Zeratul ban sure seems like it stems from a bug of some sort that was recently discovered in a professional tournament that allowed the stealthy Protoss warrior to shoot across huge distances on a map with lightning speed—something he’s not normally able to do. The bug affects a special move called “Shadow Assault,” one of the two powerful “heroic abilities” that Zeratul (like any HOTS character) can unlock once he reaches level 10 in a given match. When cast, the ability overclocks Zeratul for a few seconds—increasing his attack speed by 20% and making him leap forward to an enemy he’s attacking. Zeratul is a stealth-based assassin who’s supposed to duck in and out of combat and deal massive amounts of damage so quickly his enemies barely have time to react, let alone defend themselves, so Shadow Assault is a logical boost to his base performance. Most players don’t see it as a defining element of his character or an especially powerful addition to his moveset, but it nonetheless helps him close the gap between himself and a target trying to flee from his deadly attacks, allowing him to relentlessly hound down enemy targets. Only to a point, however. Like any ability in Heroes of the Storm, Shadow Assault isn’t supposed to give Zeratul powers so super they risk breaking the game. Fans started to notice that the move was unlocking incredible feats last week, when a player for the Korean pro HOTS team MVP Black used Zeratul in some strange ways in a grand final tournament match against rival team Virtus.pro. Many players were concerned to see Zeratul’s suddenly turn into something far more powerful than it originally was. Normally, the Shadow Assault charge is little more than a hop—albeit a very violent hop. This GIF pulled from a YouTube tutorial shows how it works as intended. 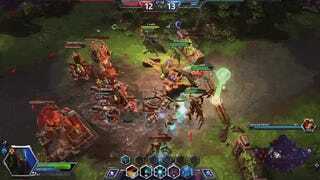 Hunt is an extremely powerful move for targeting enemies foolish enough to isolate themselves late in a Heroes of the Storm game. But the reason it works on Illidan rather than Zeratul is because it’s balanced out by other aspects of his character. He doesn’t become invisible like Zeratul does thanks to his stealth ability, to name a major one. That’s how stuff is meant to work in MOBAs—the seemingly ludicrously overpowered abilities are dialed back by the weaknesses the same character suffers from. Blizzard clearly thought that Zeratul’s newfound teleportation powers imbalanced enough that it decided to pull the guy from professional-level play. As The Daily Dot noted today, this has left some HOTS teams like Team Liquid in an awkward position of suddenly being left without a long-standing character in the game they’ve come to rely on. He therefore concludes that Shadow Assault should be seen as one of those wonderful little “oddities” in HOTS like the ones high-level StarCraft players used to discover—advanced techniques that separate the top players from the rest of the lot. It’s a nice line of thinking, but Blizzard wasn’t having it. Today in a small list of patch notes, the developer said that it’s putting out a fix to resolve “an issue that could allow Zeratul to travel much farther than intended while using Shadow Assault.” It’s not clear if or when this will impact his tournament ban. We did identify an issue that allowed Zeratul to travel much farther than intended while using Shadow Assault, which will be hotfixed today. Due to this, Zeratul was only banned from today’s EU Qualifiers event, but will not be banned from other eSports tournaments.